HONOLULU – The Hawaii Department of Transportation (HDOT) Airports Fire Chief Martinez Jacobs, Airport Fire Chief Glen Mitchell and Assistant Chiefs John Kennedy and Raymond Vegas (Ret) received the Employer Support of the Guard and Reserve’s (ESGR) Patriot Award during a ceremony on Tuesday, July 11, 2017 at 10 a.m. which took place at the Daniel K. Inouye International Airport. 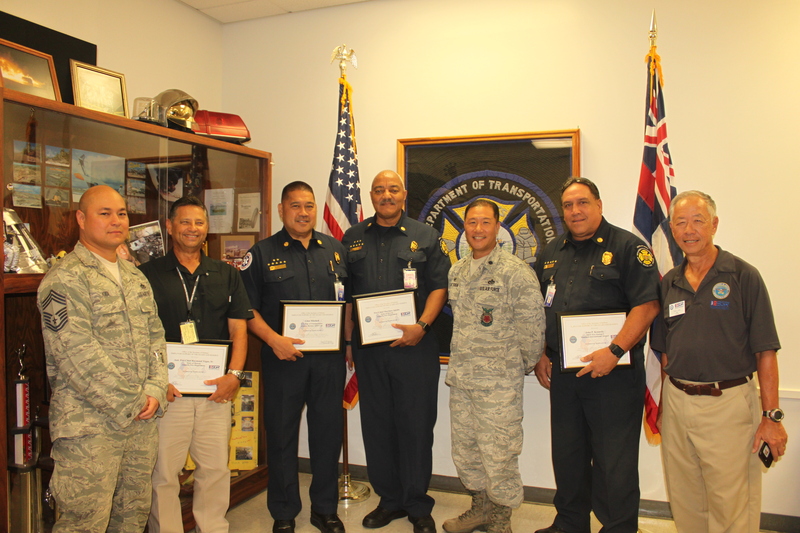 The award was presented by Robert Lee, MG (Ret), ESGR Hawaii State Chair. The Patriot Award is given to individuals who support citizen warriors through various measures including flexible schedules, time off prior to and after deployment, caring for families, and granting leaves of absence if needed. The Patriot Award is part of a series of ESGR’s Employer Awards that recognize employers who support their Guard and Reserve employees. This support increases retention rates in the Armed Forces which strengthens our national security. More information on ESGR’s Employer Awards can be found by clicking here.